The number of Americans owning RVs is at an all-time high, according to the Recreational Vehicle Industry Association. More than 8.9 million households owned a motor home in 2011, and ownership is continuing to rise. Whether your purpose for purchasing an RV is to depart on a cross-country excursion, provide a seasonal secondary residence, or for quick weekend getaways, the one destination that should be on your list is month to month storage at Vines Storage. Vines Storage on East Colton Avenue in Redlands offers flexible month to month storage so you pay only for the time you need to park your RV, and not be locked into a rigid long-term lease. The goal at Vines Storage is secure, affordable, accessible storage that makes it easy for you to load up and move out when you are ready. Our facility offers an on-site icemaker with a generous 2,000 pound per day capacity, commercial air compressor, battery charger, sewer dumpsites, and filtered and purified water. As a new RV owner, Vines Storage offers some helpful advice to help you get the most from your travels, wherever they may take you. Plan a short test run venture. This will help you get acquainted with driving, parking, and setting up the RV and allow you to note any missing household essentials that you forgot to pack. Use orange rubber cones as guides to practice backing up the motor home. Disconnect water hoses, and drain and reconnect them when traveling with the RV to prevent clogging by debris. Once a year, sanitize the hoses using a mixture of three tablespoons of bleach, then fill the hoses partially full with water and reconnect the ends. When driving over dusty or gravelly roads, turn on the generator and the roof air conditioner to push positive airflow through the RV and keep dust out. If your RV has slide-outs, use caution when opening and closing in colder climates because any snowfall on top of the slide-out needs to be brushed off before closing. With your slides in, walk through your RV and make sure you can access any necessities that might otherwise be obscured. For example, is there an umbrella or jacket in a closet or food stored in a bin that is not accessible when the slides are in? When propping up the RV awning, keep one end slightly lower than the other end. This will divert rainwater away from the RV. 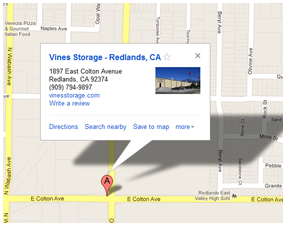 In addition, perhaps most importantly, reserve your month to month RV storage rental with Vines Storage in Redlands. Call (909)389-6209 today for rates and leasing info.